In this step we will add the FIM Service account to the two required groups for implementing SSPR. In the center pane, right-click FIMSyncBrowse and select Properties. This will bring up the FIMSyncBrowse Properties. In the center pane, right-click FIMSyncPasswordSet and select Properties. This will bring up the FIMSyncPasswordSet Properties. Click Start, select Administrative Tools, and then click Services. Scroll down and right-click Forefront Identity Manager Service, and then select Stop. This will stop the Forefront Identity Manager Service. Scroll down and right-click Forefront Identity Manager Synchronization Service, and then select Stop. This will stop the Forefront Identity Manager Synchronization Service. Right-click Forefront Identity Manager Service, and then select Start. This will start the Forefront Identity Manager Service. Right-click Forefront Identity Manager Synchronization Service, and then select Start. This will stop the Forefront Identity Manager Synchronization Service. In order for AD DS to process the password reset requests, we must enable password management on the AD management agent created in the preceding step. Log on to FIM1 as CORP\Administrator. Click Start, select All Programs, select Microsoft Forefront Identity Manager, and click Synchronization Service. At the top of the Synchronization Service, click Management Agents. Select the AD management agent and on the right under Actions select Properties. This will bring up the AD management agent properties. In the properties window, click Configure Extensions and place a check in Enable password management. The FIM Service account must have security access to the namespace and subnamespaces on the FIM 2010 R2 server. Click Start, select Administrative Tools, and click Server Manager. In Server Manager, expand Configuration, right-click WMI Controls and select Properties. Expand Root, select CIMV2, and then click the Security button. This will bring up the Security for ROOT\CIMV2. On Select Users, Computers, and Groups, in the Enter the object names to select (examples) box, enter CORP\FIMService, and then click Check Name. On Security for ROOT\CIMV2, for CORP\FIMService ensure that Allow is selected for Enable Account. On Security for ROOT\CIMV2, for CORP\FIMService select Allow for Remote Enable. Click Advanced. This will bring up the Advanced Security Settings for CIMV2. On Advanced Security Settings for CIMV2, select FIM Service (FIMService@corp.contoso.com) and then click Edit. This will bring up Permission Entry for CIMV2. The FIM1 server needs to allow WMI traffic through the firewall. In Control Panel, click Windows Firewall. On Windows Firewall, select Allow a program or feature through Windows Firewall. On Allowed Programs, under Allowed programs and features, scroll down, and then select the Windows Management Instrumentation (WMI) check box. WMI uses DCOM to communicate with the FIM 2010 R2 server. For this to occur, the FIM Service service account requires access to DCOM on the server running the FIM Synchronization Service. Click Start, click Administrative Tools, and then click Component Services. On Component Services, expand Component Services, and then expand Computers. On Select, Users, Computers, and Groups, in the Enter the object names to select (examples) box, enter CORP\FIMService, and then click Check Name. On Access Permissions, select FIM Service (FIMService@corp.contoso.com) and place a check in the Allow check box for both Local Access and Remote Access. On Launch and Activation Permissions, select FIM Service (FIMService@corp.contoso.com) and place a check in the Allow check boxes for Local Launch, Remote Launch, Local Activation, and Remote Activation. The default questions for the Q&A gate are Question 1, Question 2, and Question 3. These need to be changed to real questions. Click Start, click All Programs, and then click Internet Explorer (64-bit). This will open Internet Explorer. In the Internet Explorer toolbar, enter https://fim1/identitymanagement in the address box, and then hit Enter. This will bring up the Forefront Identity Manager 2010 home page. On the right, under Administration, click Workflows. Double-click Password Reset AuthN Workflow. This will bring up the Password Reset AuthNWorkflow. Click the down arrow next to QA Gate, this will expand the details. Click Edit. Navigate to Step 2, remove Question 1 from the box and enter: What is your mothers middle name? Navigate to Step 2, remove Question 2 from the box and enter: What is your fathers middle name? Navigate to Step 2, remove Question 3 from the box and enter: What was your first pets name? Click Save. Click OK. Click Submit. By default, FIM has several Management Policy Rules disabled that need to be enabled for SSPR. Log on to CLIENT1.corp.contoso.com as CORP\Administrator. On the right, under Administration, click Management Policy Rules. In the list of MPRs, locate Anonymous uses can reset their passwords and click it. This will open the Configuration page. Clear the check box next to Policy is disabled. In this section we will install the rich-client on CLIENT1. Navigate to the directory that contains the binaries for Forefront Identity Manager 2010 R2 and double-click FIMSplash.htm. This will bring up the Forefront Identity Manager 2010 R2 splash screen. On the splash screen, click Install Add-ins and Extensions, 64 bit. You will see a pop-up that says Do you want to run or save this file? Click Run. This will take a minute. Then you will see another pop-up asking Do you want to run this software? Click Run. 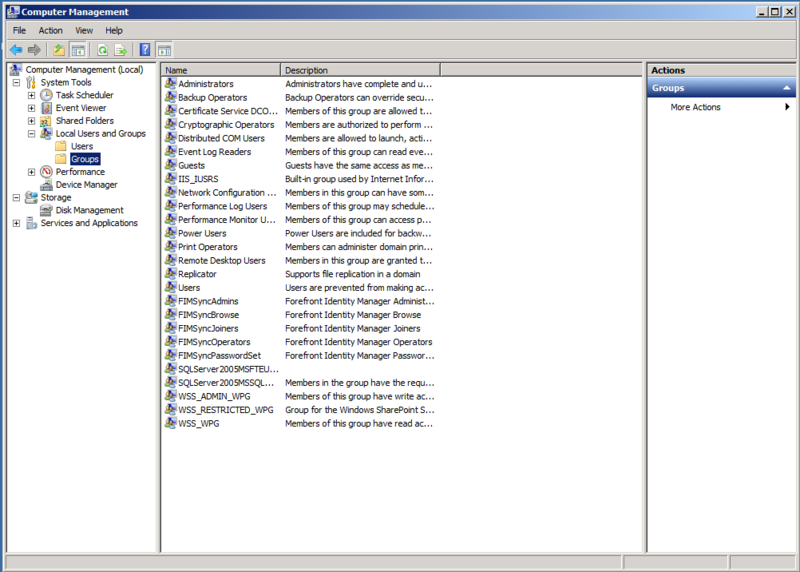 This will start the Forefront Identity Manager 2010 R2 Add-ins and Extensions Setup Wizard. On the End User License Agreement page, read the License Agreement, select I accept the terms in the License Agreement, and then click Next. On the FIM Customer Experience Improvement Program page, select I don’t want to join the program at this time, and then click Next. On the Custom Setup page, click the drop-down list next to FIM Add-in for Outlook, select Entire feature will be unavailable. On the Configure FIM Add-ins and Extensions page, in the box next to FIM Service Server address: enter FIM1 and click Next. On the Configure FIM Add-ins and Extensionspage, in the box below Intranet Registration Portal URL: enter https:passwordregistration.corp.contoso.com and click Next. Once the installation is complete, click Finish. You will be prompted to restart your system. Click Yes.